In a stroke of brilliance, Jessica Valenti has named a new trope: Sad White Babies with Mean Feminist Mommies. The trope offers a visual “no” to the question that won’t die, “Can women have it all?” It serves as a cautionary tale to all the ambitious feminist ladies out there: go right ahead, get a good job, but don’t think for a second that you’re doing the right thing for your (future) child. Thanks to Larry H. and Zeynep A. for sending it in! TIME has an alternative image of the working mom that I thought was quite cute. something doesnt fit with sad white baby number 6. Of course, if you do a search for "working woman" you get photos of women in business... without children (except for a couple examples). I think that part of the problem is that the phrase "working mother" carries with it the question of how to depict "mother" without also showing children. A woman in a photo without a child (especially a baby) does not necessarily evoke "mother". Doing a similar search for "working father," you get a lot of photos of men in suits with a child (often a baby). Some happy, some exhausted. Only a few with women in the photo. I don't know how one can show - in one photo - "working women" without a child (or business suit) in the photo, and (perhaps more's the point) I don't know how to get photographers to actually depict tableaus that go against the social constructions that currently stand. I'd be interested if anyone knows of any research about how photographers chose themes for their stock photos. Since most are freelancers, I'd imagine that they have to come up with their own ideas of what's most popular and likely to sell. It'd be an interesting lens to understand how these kinds of tropes get perpetuated and reproduced. Please change the title to a less racialized one! you are defeating the purpose!!! You are implying that only white kids can get sad if their mommy works or that any other child besides a white kid, doesn't have working mothers like the ones in the pictures.So many assumptions that hurt the point you are trying to make. Interesting discussion starter. But, in our current world, a stay at home mother could as easily be posed in the same way. She may be looking at Soc Images on Pinterest, in fact. True the immediate idea is to push us to working moms, the ideal woman is not a homemaker anymore, but an actively engaged woman who pursues adult interests outside the home, and has a housekeeper to do what the stereotypical woman would have done fifty years ago. My wife works two nights a week for just a few hours, but I could see her in several of these poses, on the phone with family, or working on school activities, or in some other way engaging in personal business. I think it is less the working mother, and more the election of women to have a separate life outside of home, whether it be professional or personal. I clicked on the link for working mother pictures, and there are actually some good ones. My favorites are an smiling asian mother with her baby and a little girl holding a wooden spool to her ear like her mommy. "...but don’t think for a second that your doing the right thing for your (future) child." That last photo of the mom and little girl in the same pose with the same laptops? My (now 12) niece and I did that (unintentionally) when she visited me at my office one Friday a few years ago. She even wore business casual with cute kitten heel sandals and brought her laptop and bottled water. Just like every other woman who walked through our office doors! We set up shop in my cubicle and looked really intense...me writing technical documentation, she making fun of a Barbie video game (where does Barbie put her outfit after she changes clothes in the middle of running down a hallway to spy on bad guys? No, I don't want to know). Society conveniently forgets that women have always worked. It's just in the past few decades, when upper middle class white women entered the workplace, that people are all in a tizzy over it. For instance, poor black women worked as maids and cooks decades before this, and most of society at large didn't give a damn about the children they had at home. I love that. Great name for a trope! And aside from the fact that the pink and the whiteness is problematic (but I'm not going to fight it, since everything good is also problematic), that last picture is great. I think that there is another way we can interpret these images. I have researched the ways in which we conceptualise infants and young children in developed societies. Together with representing them as precious, pure and vulnerable, we also often depict them as uncivilised, lacking adult self-control, emotionally volatile and despoiling public spaces by their behaviour (for example, the constant debate over whether infants should be allowed on planes). Many of the images above suggest this profound ambivalence we have about infants and small children: how we both fetishise them as the most important and adorable of all humans but also find their demanding, uncontrolled behaviour as annoying and difficult (see my post on this http://simplysociology.wordpress.com/2012/05/24/animals-as-children-children-as-animals/). I can't help but get a chuckle out of that first image. She's carelessly holding the bag from one rather than both handles so the kid could topple out at any moment. This make her EXTRA evil. Wouldn't "Sad White Babies with Mean Working Moms" be more apropos. The mere fact that a woman is working after having given birth does not automatically make them a feminist. This one is a bit narrow... how about single mothers? they need to work no matter what.. lets try to build a word without labbeling. Come on. There are choices out there and every woman has the right to chose it. The Valenti link in the first line of the post actually mentions this - that no matter the quality of the writing, the picture is sending a certain message. And we all know a picture is worth at least a thousand words! So there are no problems with child care in the everyone-working world. Happy photos would make everything good? I don't think so. The pictures also erase any responsibility of a) fathers and b) employers. If "Oriental" is considered a pejorative then surely "Occidental" is. The author is from Occidental College. How in the world is it misleading? 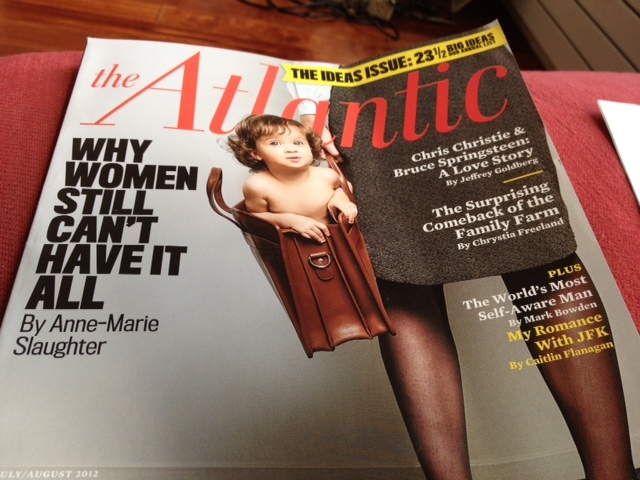 The Atlantic article was about institutional barriers and the editorial decision was to go with a child precariously perched along with mother's work. It fits the pattern that is being described. I am not sure the last picture is a remedy for all the previous toxic portrayals of "working mom". While it is unarguably a MORE positive portrayal, it carries a lot of negativity too. 1. That quality time with mom still has to be mom working and distracted 2. Promotion of loss of individuality is a good thing and 3. That young children should be behaving like adults. Let's get real here. While the picture is cute if we WANT to portray the work of mothers in a positive way we need to communicate that the quality time we DO spend with them - with perhaps a bit more cash on hand and a little more time in between to make hearts grow fonder - is just as comparable to the quality moments that would only be periodic should we stay home with them all day. We SHOULD be entirely focused on our kids when we can be and we should revel in their age and stage instead of trying to ignore it or rush them out of it but that doesn't mean we have to give up our lives, dreams, goals, or other needs to do it. How about a working mom in a suit playing trucks with her son on all fours, presumably after just arriving home from work? Or a family of four all doing a show and tell at the dinner table of something they learned or accomplished today while each was at their place of work or play? THOSE are healthy images - not any of the ones I see up there. Oh but men, men CAN have it all! Because they don't have to take care of the babies. People have been reading too much John Gray Venus/Mars pseudoscience. This trope is all about the experience of a certain stereotype of middle class women - presented as suit-wearing office workers - ignoring workers who don't work in offices. Working mothers who don't work in offices will often have even greater problems and pressures in juggling their working life with family life. Of course it can be difficult organising childcare if you're working 9-5 in an office and on a middle income, but if you're working shifts and/or bringing home a low wage it's likely to be even harder to manage to balance things. A Google image search for "working mother" or "working woman" shows lots of pictures of women in suits or smart business dress, but where are the manual workers and workers in uniform? A photo of a nurse, shop assistant or police officer would indicate a 'worker' just as effectively as a photo of a woman in a suit, but I don't think I've ever seen a 'juggling working mother' photo showing a working woman in uniform. This is probably related to the way in which these photos tend to focus on women trying to work while their children are present, rather than having breakfast with children before heading off to work, saying goodbye before heading off to work, or greeting children as they return home after work. I don't agree with that at all, what a load of rubbish! This is quite hilarious. It is safe to say I may be the mom on the bottom with my daughter right beside me mimicking my every move. I am a hard working female because my mother was too. I admired my mother from birth. She was a strong single parent who balanced work, school, love and me all at the same time. Now my mom is married with a three year old doing it all over again! Guess what? you can't have it all. no one can have it all. posts like this just perpetuate the myth that if you just work hard enough and don't listen to naysayers, you can accomplish anything. A quick look at "Images: working father" -- in most of the images on the first page of results, the dad may look content, tired, or a little frazzled... but the CHILD always looks content. Sleeping baby, toddler looking up adoringly, etc. It's super interesting to google "working dad". Images provided by google are very similar to the alternative image provided here.